Welcome back to Tuesday Tutorials. This week I’ve started sewing again after a long absence and I’ve been loving it! We spent last weekend reviewing a cottage staycation (more on that later!) where I did some work on leather bag I’ve been making forever and when we got back I started a sewing project for my son (more on that later too!) Because I’m a bit thrifty though I hate throwing nice material away so I’m always trying to think of things to do with the scraps, after all that stuff is expensive! 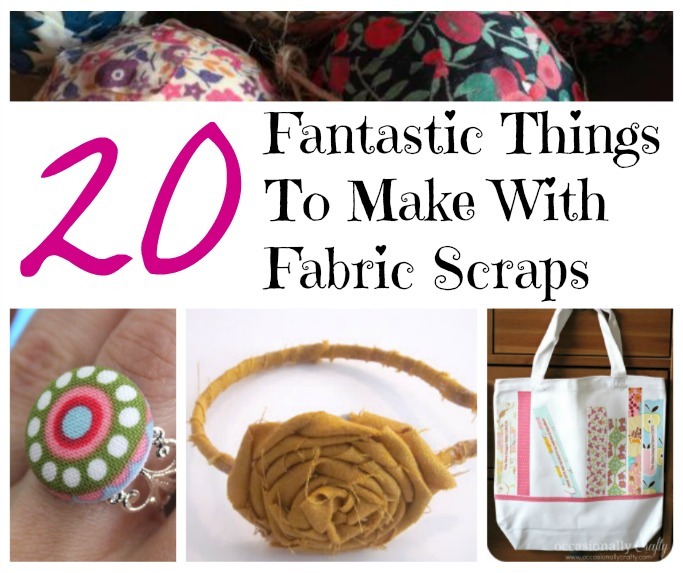 Thankfully Tuesday Tutorials came to my rescue via some of the posts linked up last week and inspired this round up of fantastic things to make with fabric scraps. 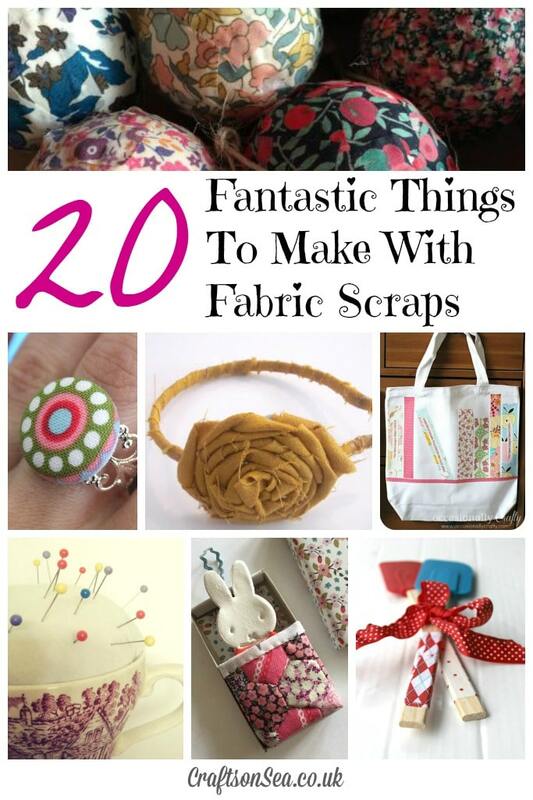 I want to try making these fabric rings and hairclips from Happiness is Homemade. These DIY headbands from See Vanessa Craft are adoreable – I love the flower! I love the way Occasionally Crafty has used scraps to decorate these tote bags. Pretty much all you need is a fabric scrap and a teacup to make this sweet pincushion. Yeah, so I’m kind of in love with this sweet tutorial on how to use your scraps to make a bed for Miffy! I would love it if someone made me these fabric wrapped kitchen utensils, what a great stash buster! I love these fabric patch plant pots from Mum In the Madhouse and might try them this weekend! If you have leftover felt you might like to make this Minion finger puppet! If you don’t want to use your fabric scraps for sewing then your kids will love doing this fun experiment. If you have some leftover felt scraps why not make it into a cute fuzzy felt set like this? Why not use some fabric scraps to customise your clothing? This decoration made using fabric scraps from One Creative Mommy could easily be changed to suit the colour scheme for the rooms in your home. This flowered headband from felt scraps would be super cute to make! Want to keep your kids busy? How about this fabric streamer from Hands On As We Grow? I love these sweet fabric letters from Glued to my Crafts. This scrap fabric bunting would be perfect for birthday party celebrations. This fabric scrap wreath from Create and Babble is gorgeous! These DIY bean bags from Happy Brown House are a great sewing project for beginners too. Ahem. Totally got carried away with myself there, I only meant to link four or five things, but it would appear I now have 20 things to make with fabric scraps. Oh well, that should keep me busy! If you are new to Tuesday Tutorials, welcome! All you need to do is link up 2 or 3 posts below and it will be shown across the four blogs that host this linky. Each week each of the hosts pick some of their favourites to showcase in their round up, so if you’re linking up please be aware that we may use and crop of of your images to make it into a lovely pinnable image like the one above! If we showcase your tutorial then of course we’ll link back to you! Please follow the Tuesday Tutorials Pin Party board. Please also follow the hosts on Pinterest – Gude , Eileen, The Boy and Me and me – this is not essential but would be appreciated! Visit at least three other blogs on the linky and pin some of their fab tutorials to your own boards. You could use the #pintorials hashtag to let them know you found them via the linky. These are all fantastic ideas, thanks for sharing! I love the fabric wrapped utensils the best. Thanks for including me, I love this round up! Ha! Yeah, there’s a lot of cute stuff going on there!! Thanks for some great inspiration. We are almost settled enough in our new house for me to get back into sewing. I am planning a tutu from some remnants of net curtains. It’s great to be thrifty with what you have left over from other projects.